The sunshine was shining as we lazily rose. Unprepared as usual, we were heading off for 5 lovely nights at Sandy Balls in the New Forest. This is going to be the longest that we have stayed in this new ‘van. So far the most we have stayed in it is 2 nights. We threw a few more clothes into the bag and off we went. As we have been away regularly over the winter months the ‘van is ready to go. We just need to get the legs up and hitch up. There is something strangely satisfying about heading out on a Sunday, one of our normal working days, when everyone else is heading home after their weekend breaks. With a journey of not much more than an hour, we were arriving just after lunch. On our last trip here all was quiet, this time was different. Two weeks to go till Easter and people are definitely getting in the mood for the season. 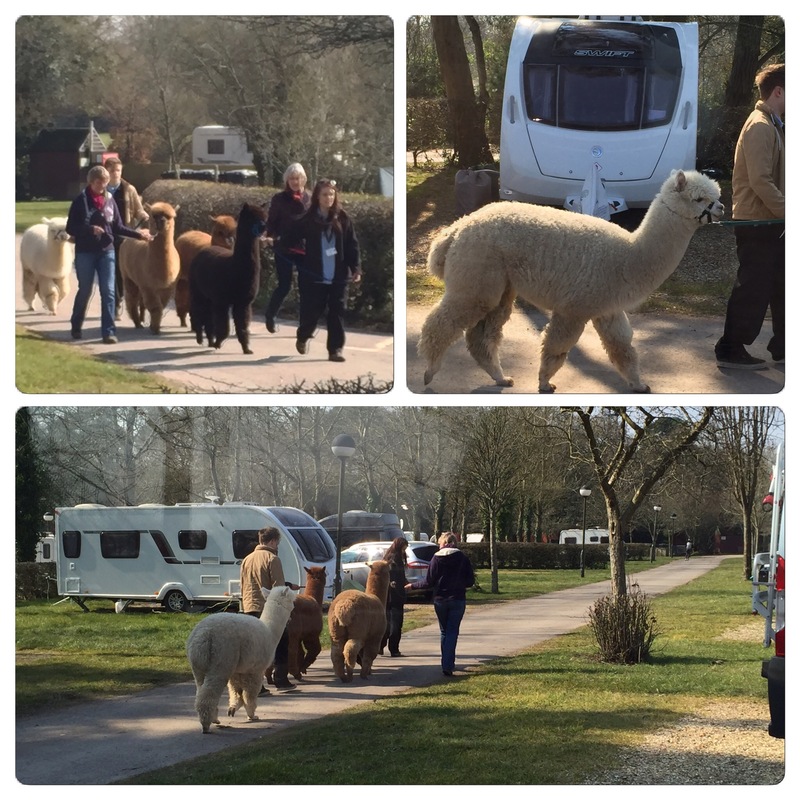 There was a queue of caravans waiting to check in. Check in swiftly done and we were on our way to our chosen pitch. 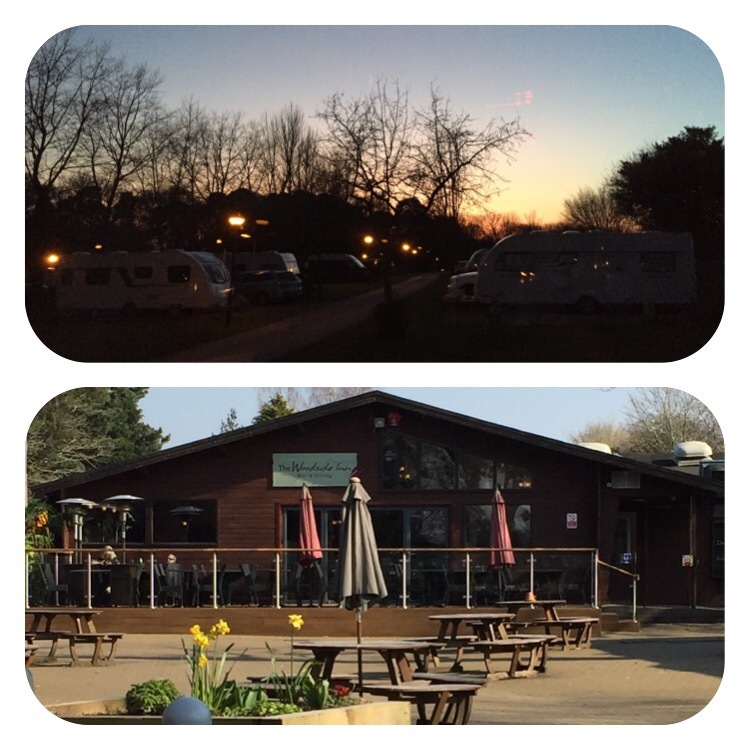 The site was open in its entirety this visit and bursting with caravans and motorhomes. The sunshine lifts the mood and people were out and about busying themselves and chatting. Another fully serviced pitch gets us to thinking that maybe we should think about buying the gubbins to have water on tap rather than filling the aqua roll. When we purchased this ‘van back in November we also bought a canopy. Having used awnings before this went up with relative ease. I think it will come into its own when the sun has warmed the world up and the hubby wants to get into the shade whilst I soak up the rays. Kettle on, time to recharge. On further investigation of our home for the next 5 days leads me to the toilet block. On our visit a few weeks ago this section of the site was still closed, so even though we were able to wander around the empty pitches we didn’t have access to the toilet block. 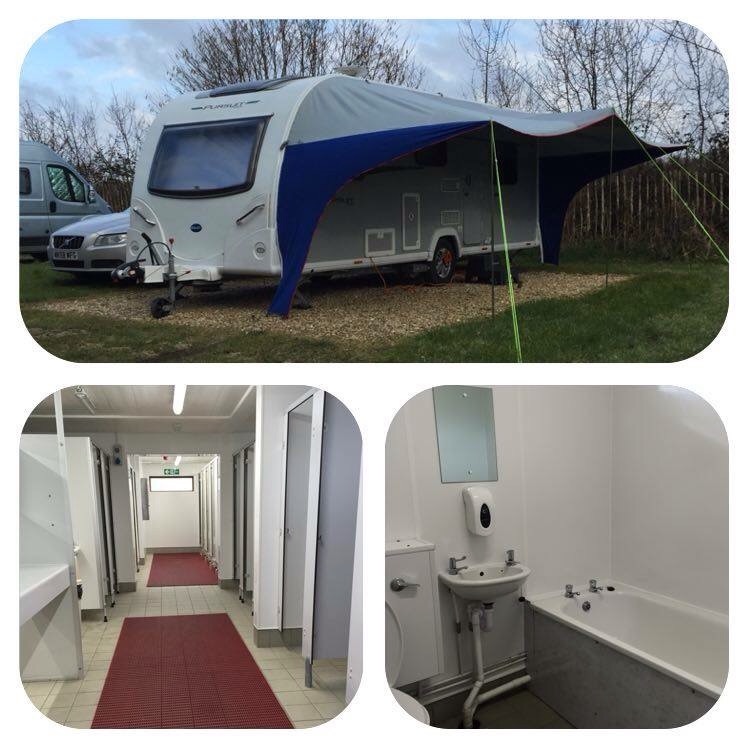 The block, with outside washing up facilities, was very modern with an abundance of, very clean, toilets, privacy cubicles and showers. This block even boasts a conventional bathroom, complete with bath! 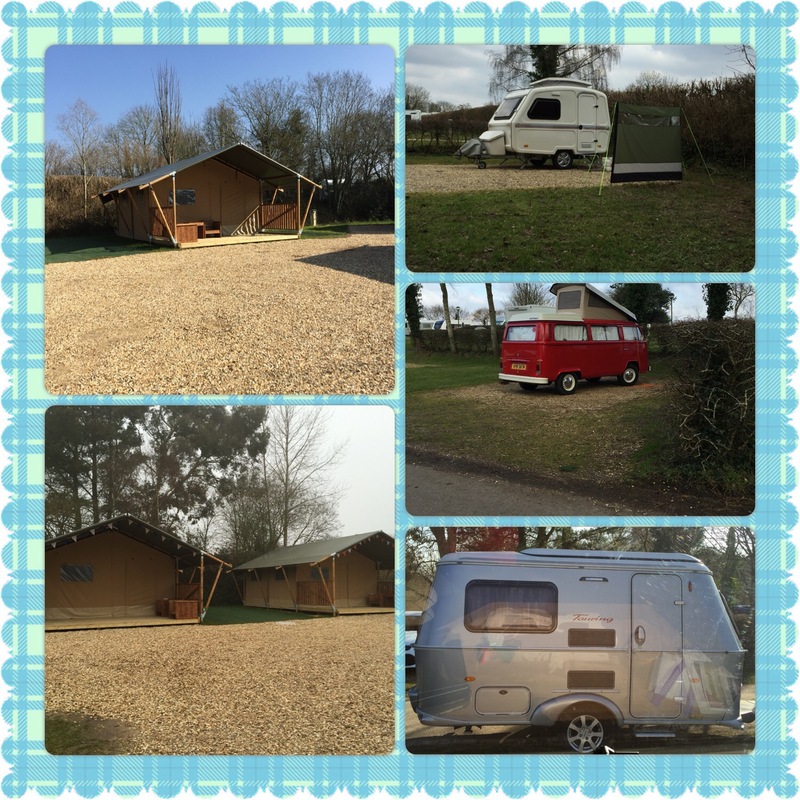 A small trundle around now fully habited pitches showed a few cute little ‘vans and newly installed Safari tents that were so new and shiny waiting for their first guests over Easter. New book loaded on the kindle. Not a normal one of my choosing but was highly recommended so thought I’d give it a go. Richard Madeley’s The Way You Look Tonight . I thought I was in for an easy read, love story. The cover doesn’t really give much away and I would imagine that it gets over looked when people are choosing a book to read. Within the first few well written, extremely descriptive pages I was gripped. Then it took a twist, this wasn’t going to be a soppy love story after all. A quick trip into the park’s village centre for an internet fix and a little bit of shopping. The well stocked shop is open until 7pm in the evening and was able to provide the essentials needed to tide us over. Internet checked on one of the plentiful benches in the late afternoon sun, we headed back for something to eat. Spring is definitely here, we had daylight until around 6.30pm, so much nicer being able to keep the blinds open for longer. Monday dawned bright and early with more sunshine. Having breakfast watching Alpacas being taken for a walk is so much better than breakfast tv. Having had really bad colds in the lead up to this break we decided a day mooching around the site and resting was the plan for today. Being a member of a couple of caravan related Facebook groups I’d discovered that a fellow member was going to be here whilst we were. Having exchanged pleasantries online we set out for a trundle to see if we could find them. Armed with the knowledge of the type of dogs they had, they were easily discovered. Two bouncy Labradors greeted us as we introduced ourselves. Conversation came easy and we promised to try to catch up later in the week. Tuesday, it was decided was going to be a trip out. Having been away with work in October, I’d been lucky enough to visit Chesil Beach . A bit of a drive away but wanted to share it with the hubby. The spit looked glorious on arrival in the March afternoon sunshine. We were able to drive up to the viewing point and spend some time soaking up the view. Heading away from the beach our destination was Portland Bill. Fields of Portland Stone lined the route there, plus the occasional town and village that reminded us of South West Scotland, with wide boulevards and attractive buildings. 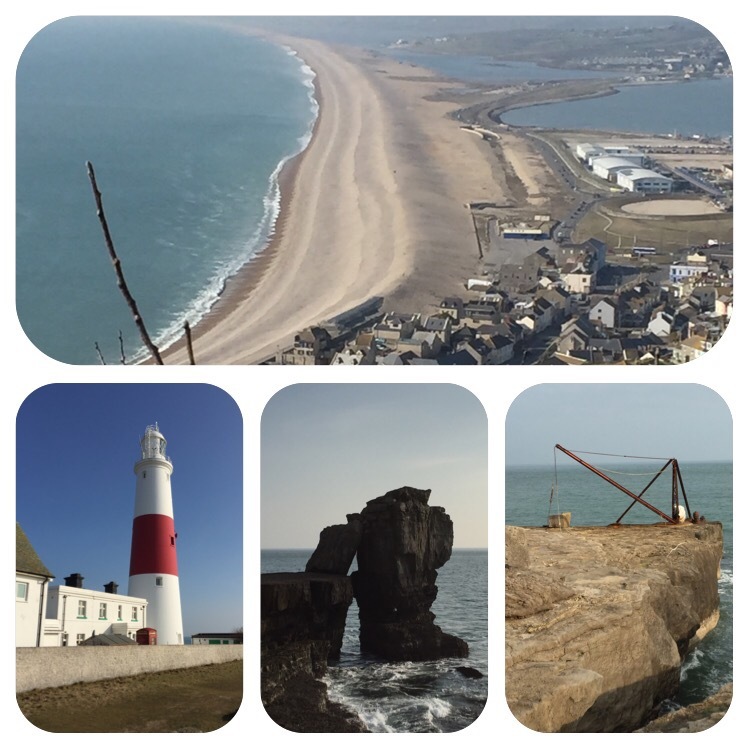 Portland Bill is the southern point of the island, dominated by a large and well maintained Lighthouse, The Lobster Pot cafe, a mini village of beach huts and numerous reminders of it’s industrial history. Walking along the densely fossil printed rocks at the sea’s edge you can’t miss the large precarious rock stack, Pulpit Rock, that kisses the mainland via an odd lean-to slab of rock. Forty-nine year old Hubby with dodgy back decided the teenagers that had considered/ignored the “at own risk” signs to summit the rock stack had gained a cool photo opportunity and immediately offered his car keys in case of imminent death, I opted for bribery of three ice creams for him to stay alive a little longer which he accepted to keep his feet on the mainland. I then reneged on my bribe and only bought us one ice cream each from the Lobster Pot, his bottom lip is still sticking out. The following day brought an invite to the local on site pub for birthday celebratory drinks with our new found friends from the previously mentioned caravan group. Lunch eaten and off we set. Drinks ordered and sat down we settled getting to know each other and of course discuss caravans. It was really good listening to seasoned caravanners experiences and adventures. Feeling slightly squiffy after a few sherbets we headed back to the caravan in time for tea. Needless to say it was early to bed with no more alcohol. Thursday, our last full day, a cooked breakfast was the order of the day. 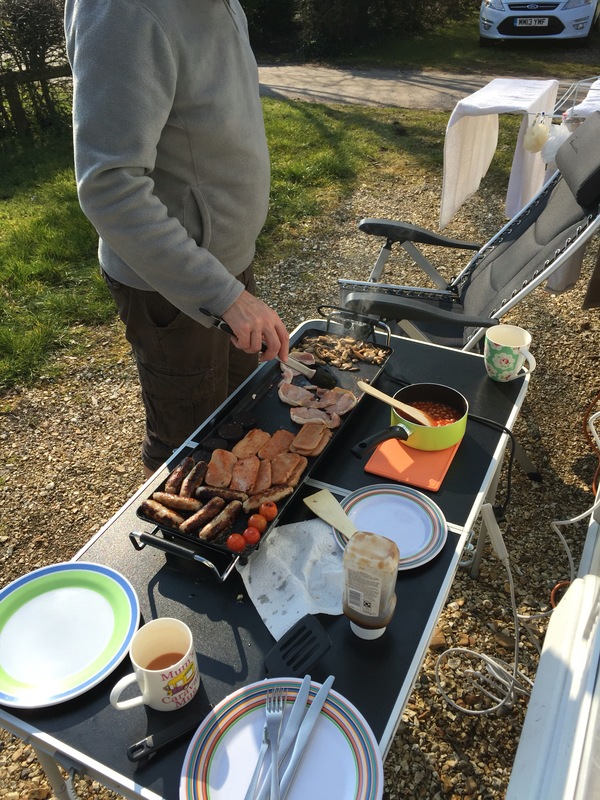 Having decided on a previous trip out not to use the teppanyaki inside we took it out into the lovely morning sunshine, cooked and ate outdoors. Just delicious. Bellies full and a walk around the Sandy Balls estate was decided upon. 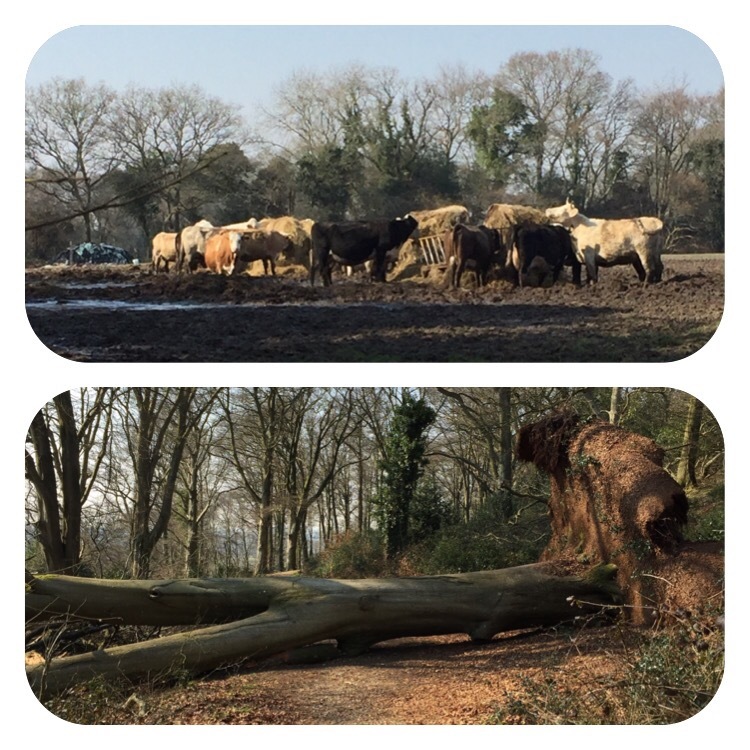 Heading out of the touring site past a field of cows happily munching on their lunch we headed into the woodland. A beautiful woodland trail took us through trees, over trees up hill and down dale revealing some breathtaking views. Heading back makes tomorrow’s imminent departure that little bit closer. A little bit down hearted as 5 nights really hasn’t been long enough. We didn’t try out their eateries or their leisure facilities. In short, in order for a Sandyballs break to be relaxing and restful but to still get time to appreciate everything they have to offer, I think you need to stay with them for at least a week. We will definitely be back for another visit later in the year.